The new PointProbe® Plus (PPP) combines the well-known features of the proven PointProbe® series such as high application versatility and compatibility with most commercial SPMs with a more reproducible tip radius as well as a more defined tip shape. The minimized variation in tip shape provides more reproducible images. 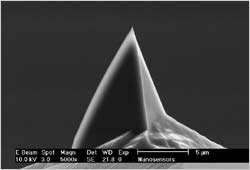 NANOSENSORS™ PPP-NCHPt AFM probes are designed for non-contact mode or tapping mode AFM (also known as: attractive or dynamic mode). This sensor type combines high operation stability with outstanding sensitivity and fast scanning ability. The PtIr5 coating is an approximately 25 nm thick double layer of chromium and platinum iridium5 on both sides of the cantilever. The tip side coating enhances the conductivity of the tip and allows electrical contacts. 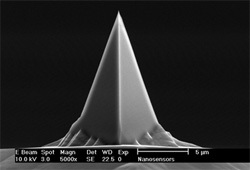 The detector side coating enhances the reflectivity of the laser beam by a factor of about 2 and prevents light from interfering within the cantilever. The coating process is optimized for stress compensation and wear resistance. The bending of the cantilever due to stress is less than 3.5% of the cantilever length. Please note: Wear at the tip can occur if operating in contact-, friction- or force modulation mode.